Today’s Three Good Things post is a little different, because I’m going to give three great options for getting involved in Inernational Book Giving Day. Celebrated on 14th February, International Book Giving Day is a way of sharing and celebrating books with as many children as possible. It feels perfect to me that that it’s being celebrated on Valentine’s Day — love of books is the best! Having had such a great time as a book giver on World Book Night, I like any excuse to share books with as many people as possible and I really like the idea of celebrating it on the same day around the world. There are loads of ways you can get involved in organising the day, see HERE for details. If you fancy joining in on the day, how you can you get involved? One: Give a book to a friend or relative: I never need an excuse to buy books for my children — I often lose far too much time in the children’s section of the local book shop! I will also buy my lovely nephew a book to celebrate. Two: Leave a book somewhere public: Many places where children have to spend time, such as hospital waiting rooms, have few books available for them to read while they’re waiting. Buy a fun book and leave it in the waiting room of your choice! Three: Donate some books: There are plenty of places who would really value the books that you might like to buy or share. Perhaps you’ve lots of books at home that your own children have grown out of? As chair of a local pre-school, I’m planning to see if they need any of the books that my children are too old for now. If there’s nowhere local, you could donate to Books for Africa. 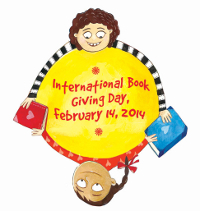 Are you planning to take part in International Book Giving Day? If so, do go to their website and let them know! This reminds me that I must take Ozzys old board books he’s outgrown to his old nursery! thanks for the sharing the love of books! Friday is going to be just awesome. Tweet what you are up to using #giveabook!